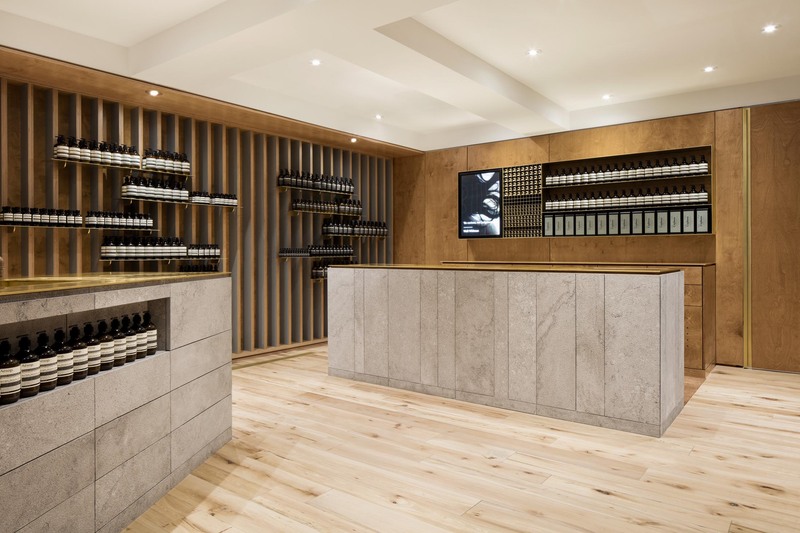 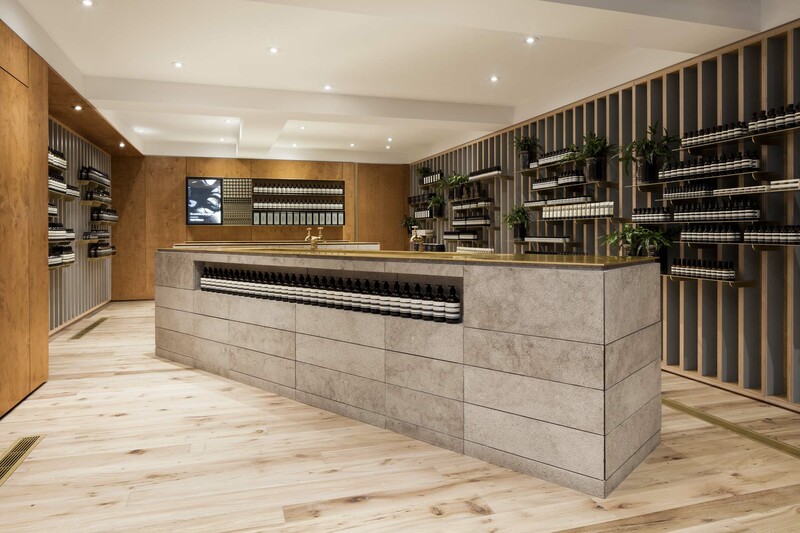 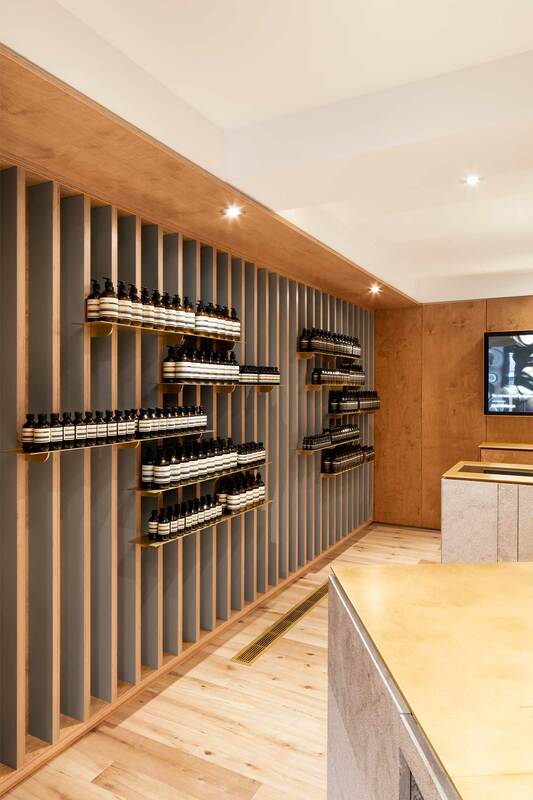 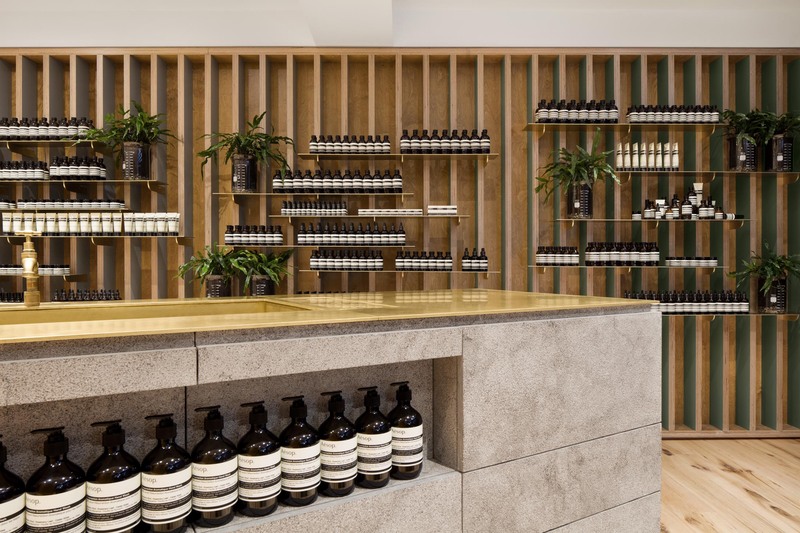 The design of the Aesop store in the Mile End portrays in simple ways, the underlying theme of movement found through the heritage of the neighborhood. 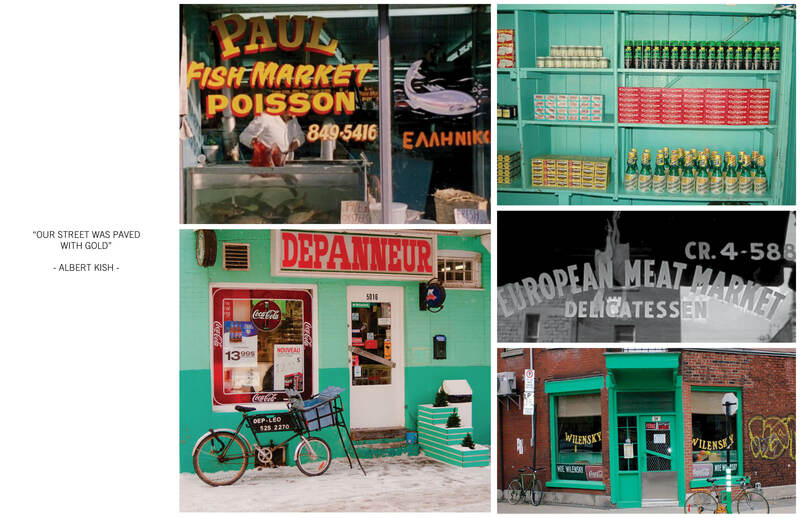 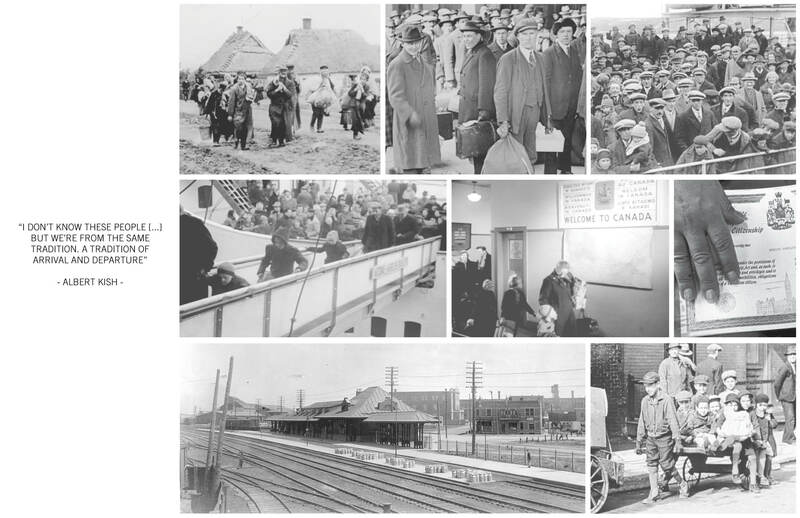 From the 1880’s to the 1980’s, different waves of immigrants settle in this neighbourhood as described by the documentary of Montreal filmmaker Albert Kish “Our Street was paved with gold”. 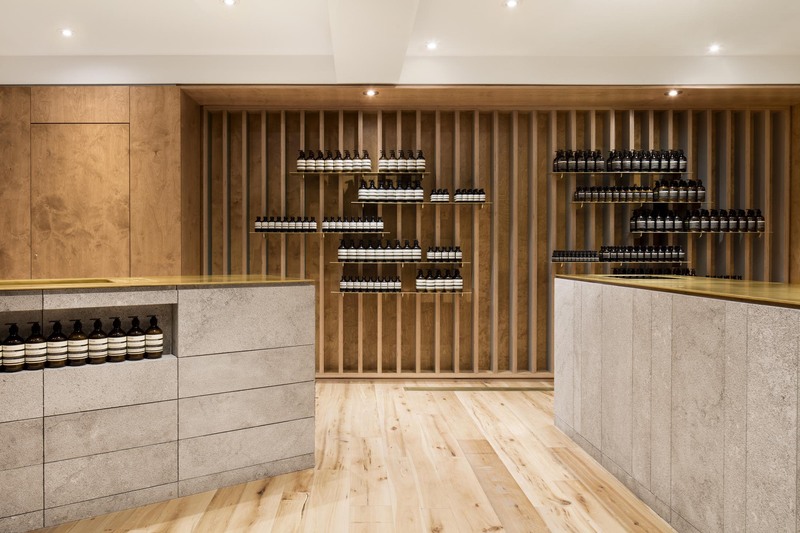 The design of this Aesop store presents itself as a common, but deconstructed, structure. 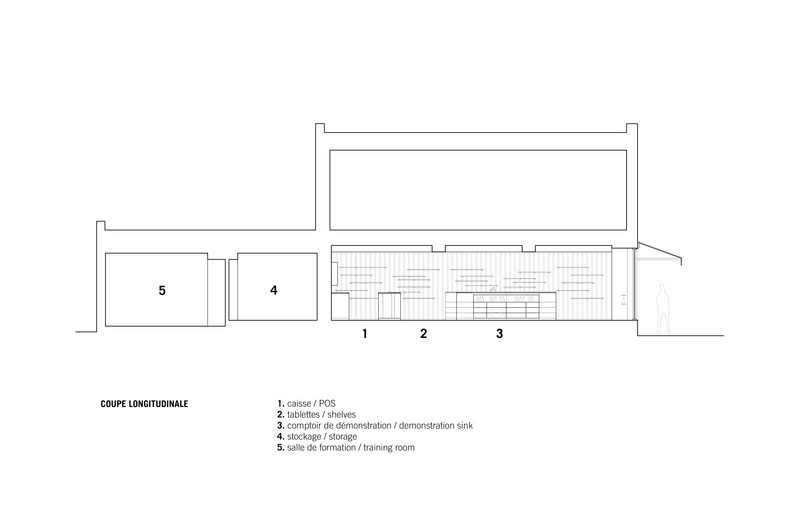 The store appears to be stripped to the bare bones, showing its structural “guts”. 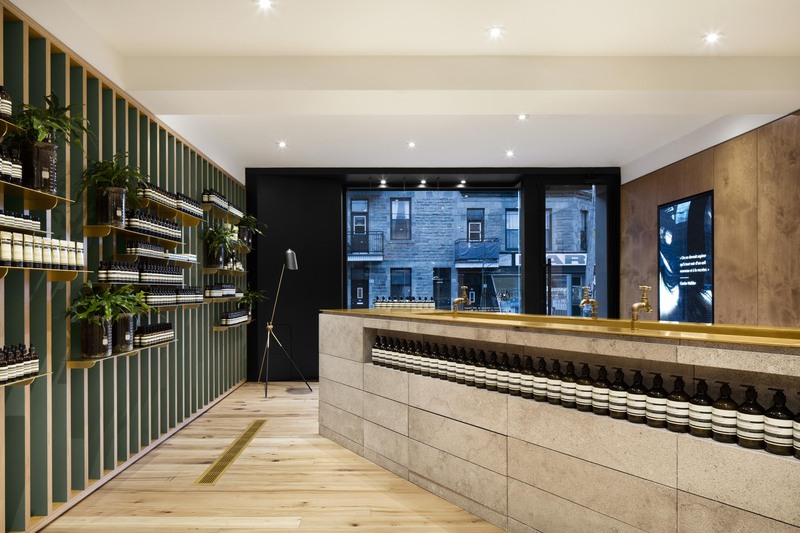 As visitors glimpse into the storefront, they are confronted at first with a familiar raw palette of materials – plaster, plywood, limestone, brass, and reclaimed wood. 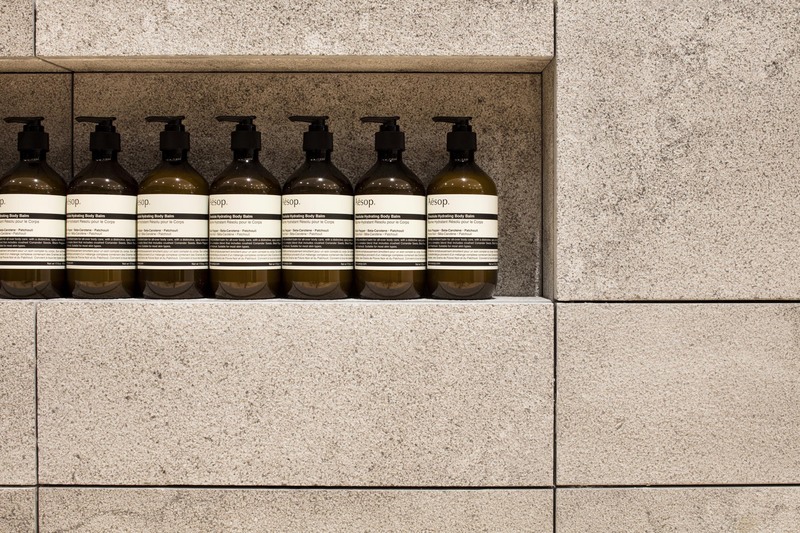 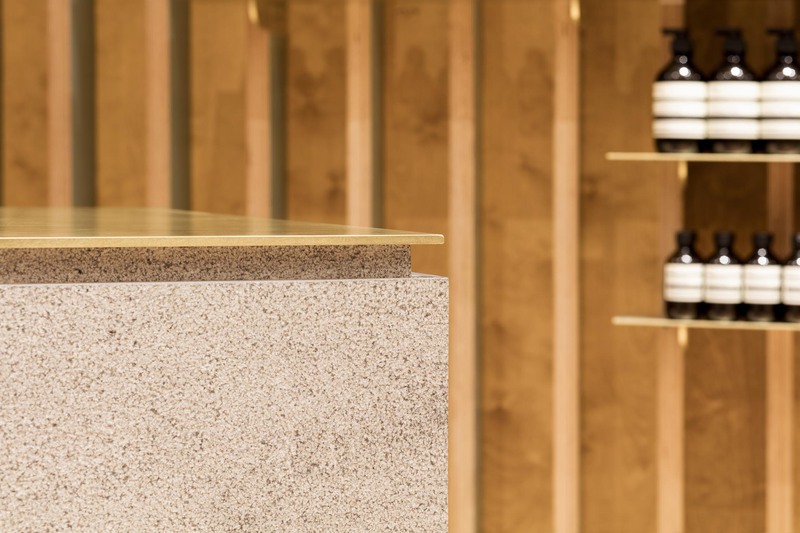 A monolithic demonstration sink, covered in local limestone stands as a visual anchor in the middle of the store compelling visitors to move around it in order to explore the nuances and elements of the walls. 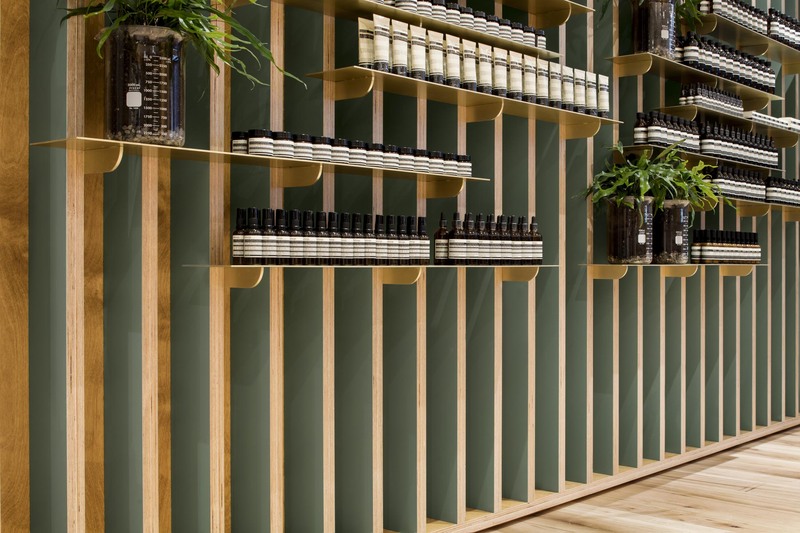 The recognizable stud wall is transformed into a plywood structure that unfolds its colors with the motion of its visitors. 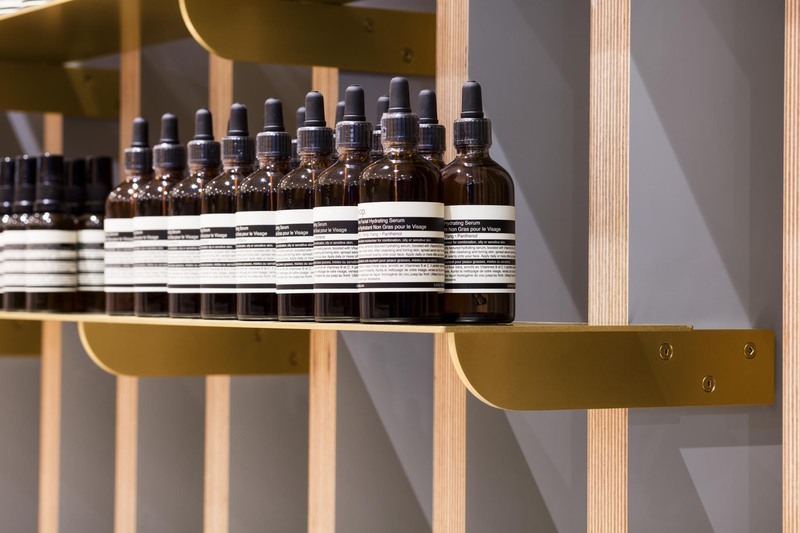 In front of the ever-changing colors of the walls, the amber glass bottles are placed on thin brass shelves appear to float as they seem to be timeless. 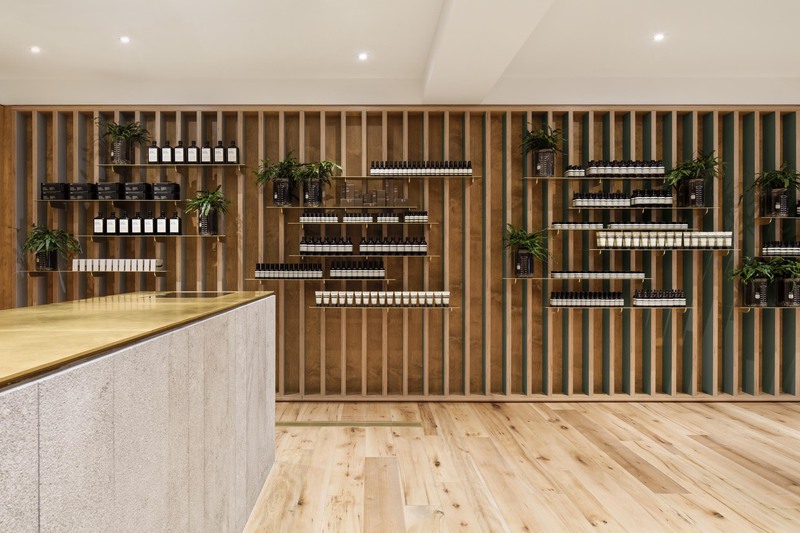 Winner of Grands Prix du Design 10e edition – Commercial space less than 1600 sqft.